Language is music. It applies to any language from any part of the globe. But, I believe that it applies even more so to Italian. I am not the first person to say this or to notice the rare musicality of the Italian language; it's as if it was created to be sung, not spoken. When poetry touches on the subject of war it stings in any language, perhaps even more so than prose. That's because its meant to be beautiful, to channel feeling without control of logic, and therefore what it throws at the reader is raw. 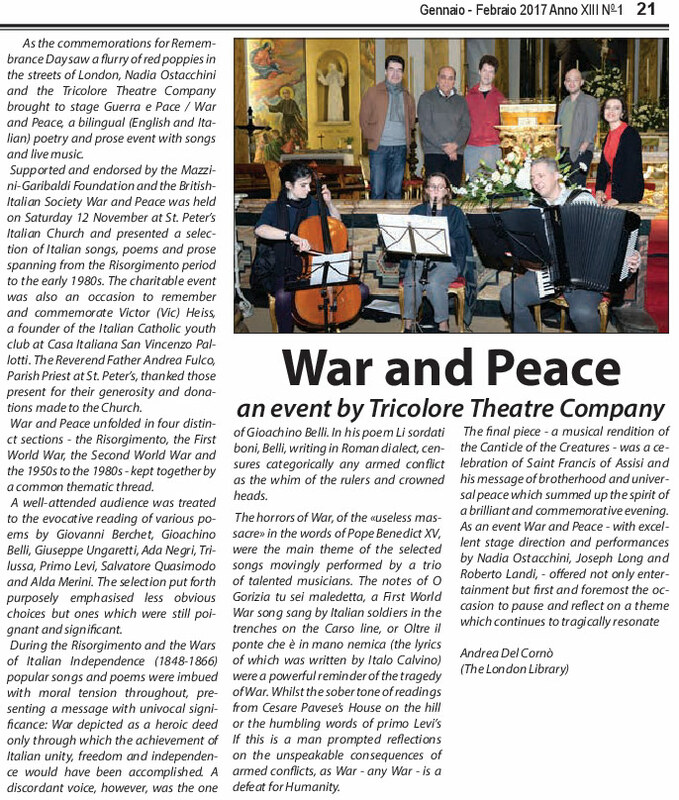 Thanks to the troupe of Tricolore and the inspired idea of its creator Nadia Ostacchini, I was given an opportunity to work with the Italian poetry of two of the greatest and most horrific wars of the twentieth century. It always amazes me how well beauty and ugliness can look when next to each another; how close are fear and joy, hate and love. This project made me see this once again. The human soul wants to live and perceives beauty even in death and the total destruction of its surroundings and familiar way of life. As bombs fall, food and comfort become scarce and friends perish in bloody battles, poetry turns into a shield, a deadly weapon of words. I would like to thank all the cast members, musicians, our composer and St. Peter's Italian Church for giving their time and talent to this project. The reading, of course, could easily work in any ordinary theatrical space. However, when the fiery, painful stanzas of Italian poetry bounced off the marble walls of St. Peter's and washed off the wooden statues of Saints, a special kind of magic happened. The evening was lifted and supported by its surroundings. When Roberto Landi's killed soldier "returned" from the war to speak to his family, the red carpet of St. Peter's was reminiscent of blood, or perhaps of a field of poppies. Interestingly, there was a very international audience at St. Peter's that evening. Some people did not understand Italian at all. That somehow did not matter. They all heard the music, connected to the energy and the main sentiment of the evening. Every nation wants peace, no mother wants her son to be killed in war, no matter how heroic or patriotic! 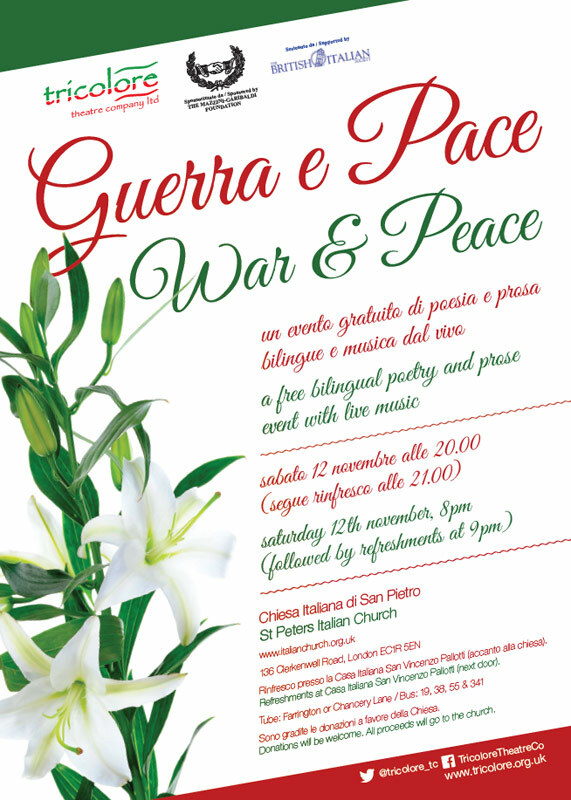 I sincerely hope that by staging "War and Peace" (Guerra & Pace) we added at least one little drop to the ocean of anti-war movement.